This little girl was waiting as I went along a track a couple of days ago. She's the female of the Pacific robin Petroica multicolor, found in the Norfolk Island forest, sometimes in places reasonably far removed (by Norfolk standards) from the national park, which is the stronghold of much of the island's unique flora and fauna. 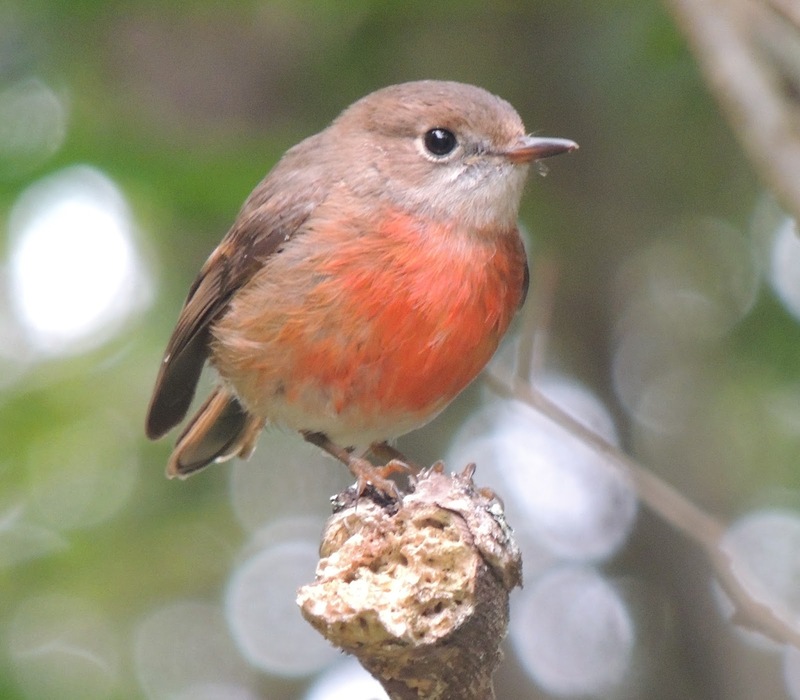 For many years the Norfolk Island robins were considered a subspecies of the Scarlet robin, but was separated out a few years ago. It's always a pleasure to find the Norfolk Island birds in so many areas around the island, and the robin is something of a favourite with everybody. They are so tiny and vulnerable, and yet seem somewhat trusting when they pop down to see who's visiting. 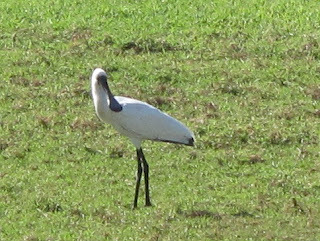 It won't be long before the male is strutting his stuff, with the southern hemisphere Spring starting to drop little hints at its imminence. Already I have seen the first clutch of feral chook chicks; sparrows are flying by trailing long grassy pieces for their nests, and the White-capped (or Black) noddies have returned from the sea and are setting up house in their Norfolk Island pine breeding colonies. It's so reassuring in a troubled world to see that nature just keeps on doing what it has always done, despite the affairs of Man. Almost 2 weeks ago (on Thursday 31 May) the first report came to me of a seal being sighted on a rock lying offshore from the Captain Cook Memorial Lookout at the island's mid-northerly point. Some visitors had been watching it for some time before they called at Bedrock for a cup of tea and were thoroughly interrogated by the owner when they mentioned they had been watching a seal. The wonderful view from this property is seen to its full potential through a well-placed telescope , and owner Byron Adams phoned me to see the seal from there. I had spent some time looking at the wrong rock from my nearby home, after the first of Byron's phone calls, so was keen to see where I should have been looking. After identifying the correct rocky haulout close by the lookout I made my way there with some kids in tow to get a closer look from directly above. The seal was lying back sunning its belly which had 3 large round pink marks that looked very much like wounds. I was later reassured by eminent seal biologist Peter Shaughnessy (of the South Australian Museum) that seals can survive terrible wounds, and it is not unusual behaviour to see them lying in the sunshine to aid healing. It is most likely that these wounds are cookie cutter shark bites; these sharks are only found in warmer waters, such as around Norfolk Island, where the water temperature rarely drops below 18c. As word got out many people came to the lookout over the next few days, the seal causing so much interest as it is a rare sight here. This is probably only about the third reported seal visit in the last decade. 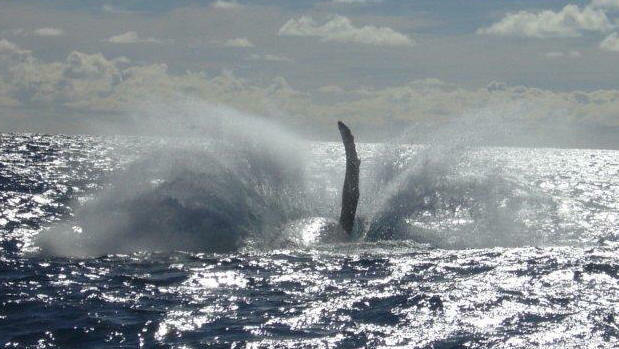 Some close up photos were taken by Tom Greenwood from his boat. Two other fishermen actually fed the seal; I've been told they threw it a kingfish which it accepted (probably quite gratefully) and ate only after taking it into the water to wash. I've heard they caught all this on a video clip and hope we might get to see it on the Internet sometime. On the following Monday and Tuesday nights we experienced extremely high winds, rough seas exacerbated by a full moon tide and all this weather blowing in from the North and Nor'west, a very unusual direction from which winds rarely batter Norfolk. The ensuing high seas washed well over the rock that had been favoured by the seal and not surprisingly it disappeared during this time, and we were left wondering about its fate. No sign of it was seen for the rest of that week and we thought we would possibly not see it again. Saturday morning around 7.20am a phone call from Michael Jack, told me that he had come very close to a/the seal as he walked along Slaughter Bay that morning, on the south side of the island. It was lying near the wall at the top of the beach and as Mike said, he was not able to say whether he or the seal go the biggest fright. Photos taken soon after by Kate McDonald and the King family showed tracks along the beach (dawdling at first and then tearing into the water in a rush), a little dugout where it apparently spent some time out of the weather and where the remains of a painted crayfish (the local herbivorous species) were found; a midnight snack? Once again many visitors came to see the seal, which stayed in the bay for some time, waving a flipper from time to time, and eventually disappearing in the directon of the Kingston pier. The most recent report I've heard (unconfirmed as yet) is that the seal was last spotted off the West coast of the island, yet again moving to the leeside as the wind driving our continuing rough weather repeatedly changes direction. It's a great thing for Norfolk to be a temporary safe haven for this injured seal, which will no doubt make its way back to the cooler southern waters around New Zealand where it was most likely to have wandered from. 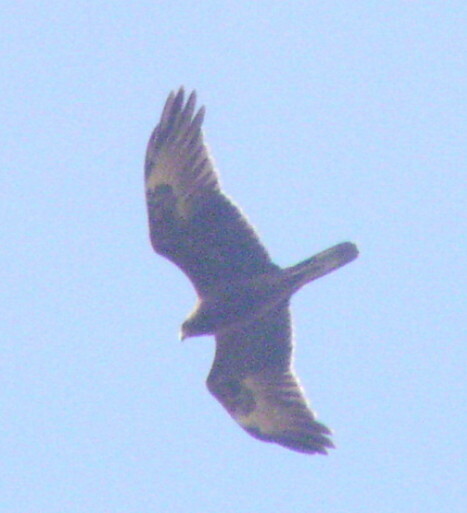 We'll be hoping for further sightings, and more photos that reassure us the wounds are improving and it can head off home. The winds are blowing straight from Antarctica, or that's how they feel. We've had strong southerlies for weeks and a fresh blast of rain and wind has arrived in the last few days. When all the folks along the east coast of Australia heave a big sigh of relief because the low pressure systems move out to sea, that's when we know it's time to batten down the hatches. Deluges of rain driven by strong winds are visiting us, mostly at night. We've had a long overnight power outage and many tree limbs falling, but no severe damage to property as far as I know. We are never sure where the exhausted birds arrive from, but it's pretty certain that something unexpected will find its way here when the winds are so strong. Our most recent arrival has been a Great Egret, which soon found the Royal Spoonbill that had only arrived days earlier, and they have been sifting the freshwater drains and wetland areas of Kingston together since they arrived. 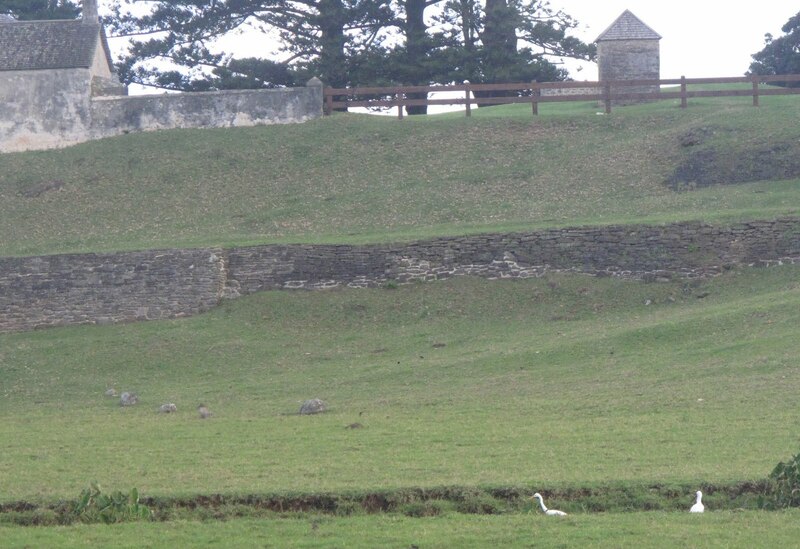 Here they are seen happily feeding in the shadow of the convict-built hospital and the rock wall that shores up the sides of a road constructed in the earliest days of the penal settlement (1788-1854). 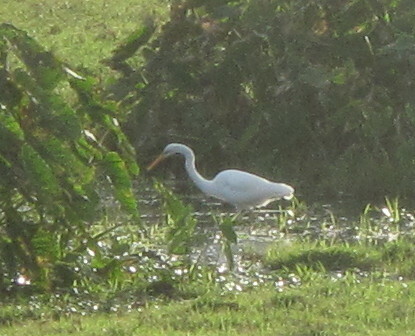 It's very interesting to have the Great Egret here at the same time as a growing flock of Cattle Egrets. From an original 6 birds the group of Cattle Egrets has gradually grown to 19 since May, and for local birdwatchers seeing the size difference in person , especially the long sinuous neck of the rarer Great Egret, is a hundred times more informative than seeing them in bird books. 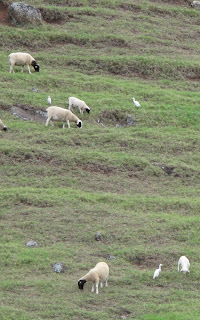 The Cattle Egrets, (fairly regular Winter visitors) seem to enjoy the company of a flock of sheep on the steep hill above the Watermill Dam (see images of the dam in previous blog re feral ducks), as well as some of our local cattle, and have no hesitation in moving around the island to the north-west for a few days, then east and then back to the south. 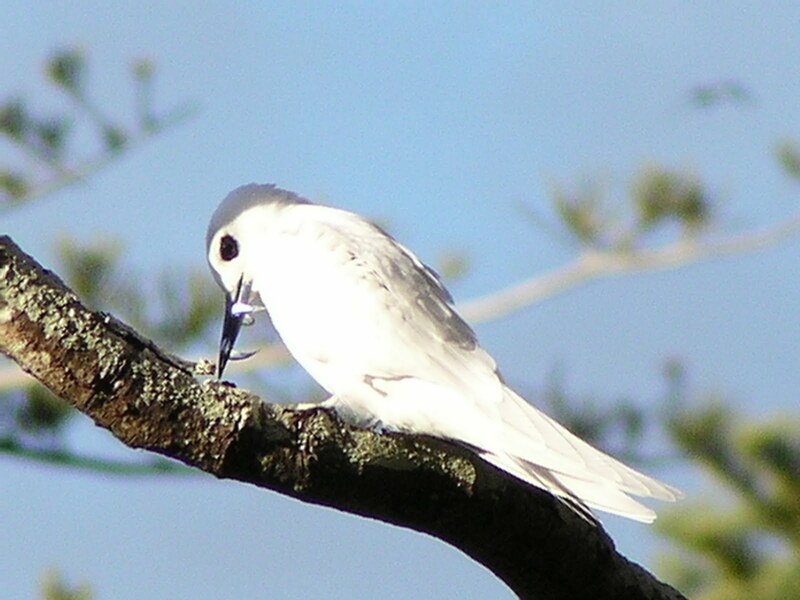 Most interesting of all however has been the exhausted Fairy Prion that was spotted and photographed by John and Sue O'Malley arriving and resting on the reef at low tide during another strong southerly wind period in early July. I've made a number of enquiries and have so far been unable to unearth a previous record of this species here, so it may be a first. With Anson, Cassidy and Lilli King we waded out and removed the little bird from the reef where the incoming tide would have swamped it within hours. Next morning when we checked on it in the sheltered location where we'd placed it above the high water mark, we found that it had quietly died during the night. One can only wonder how many hundreds of birds are blown offshore or from waters around New Zealand, Australia, even New Caledonia perhaps, and never find the tiny speck of land that is Norfolk Island. 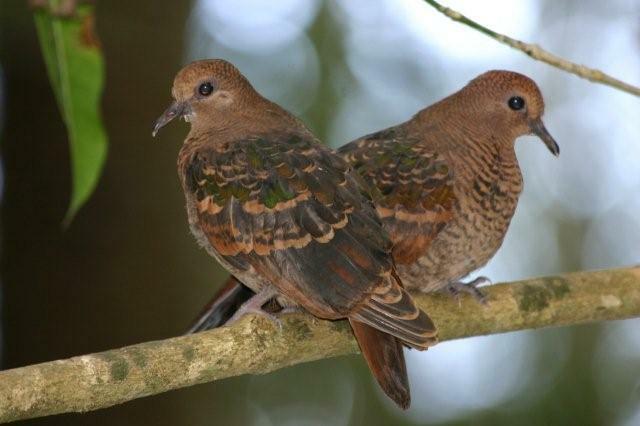 On a recent birding outing a small group of us encountered these Emerald Dove chicks sitting quietly observing us as we walked by. 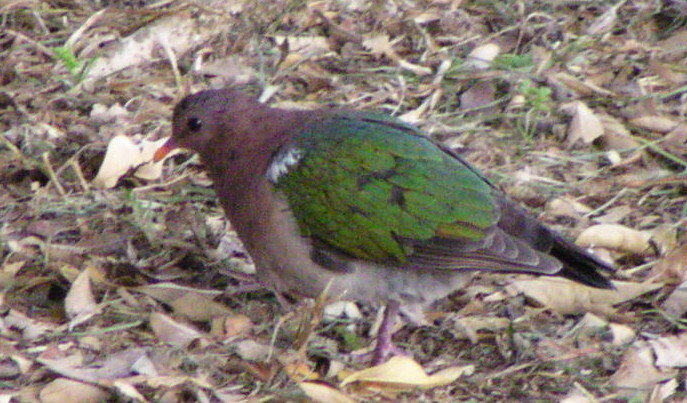 Emerald doves are widespread across the island, mostly seen alone, except during the breeding season when groups of up to 8 have been encountered. 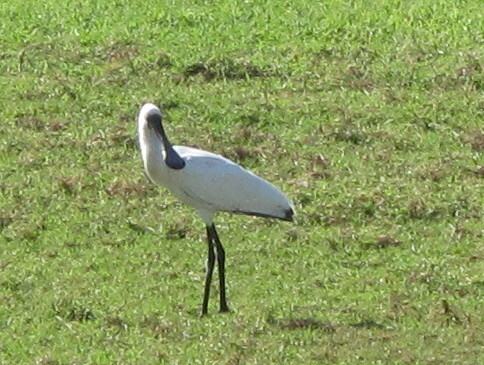 Occasionally unnaturally large numbers are found flocking where householders feed them. 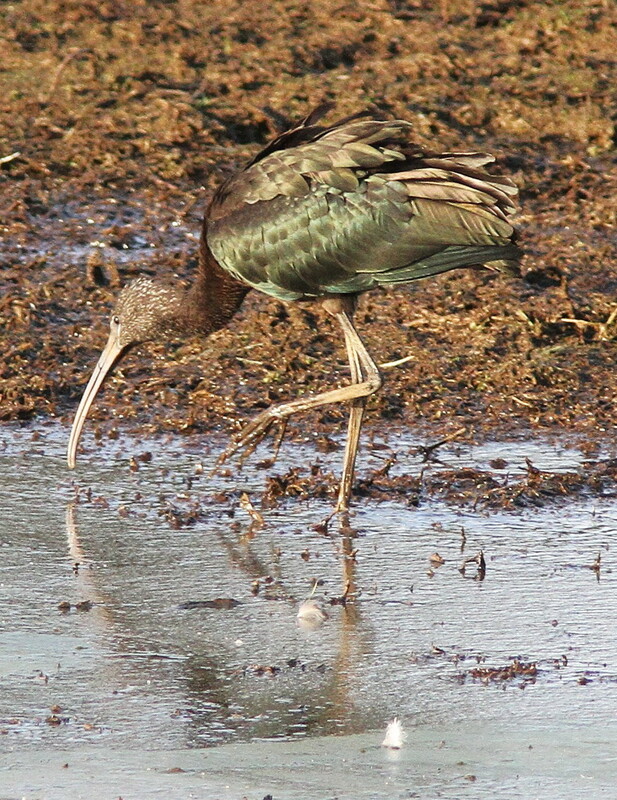 There is uncertainty about how these gentle birds came to Norfolk. No fossil material has been found to show that they were present before Man came to the island, and no definite records exist of their having been imported intentionally. 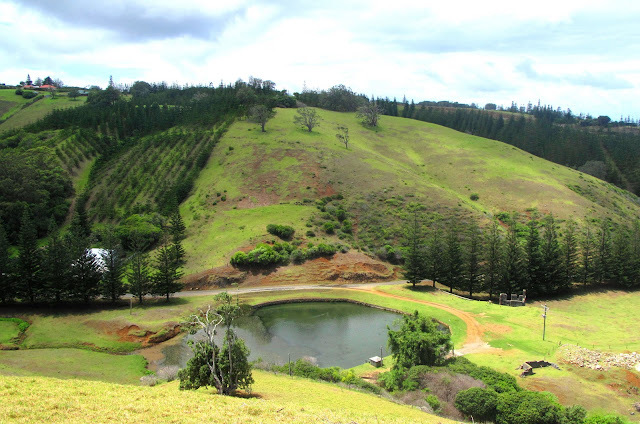 It has been suggested that they came to the island with Melanesian islanders who came to the Mission Training College that was established in Norfolk Island in the 1860s by the Church of England. Thanks to Kerri Hamilton-Irvine for the beautiful image of the dove chicks. Who are you calling feral?! 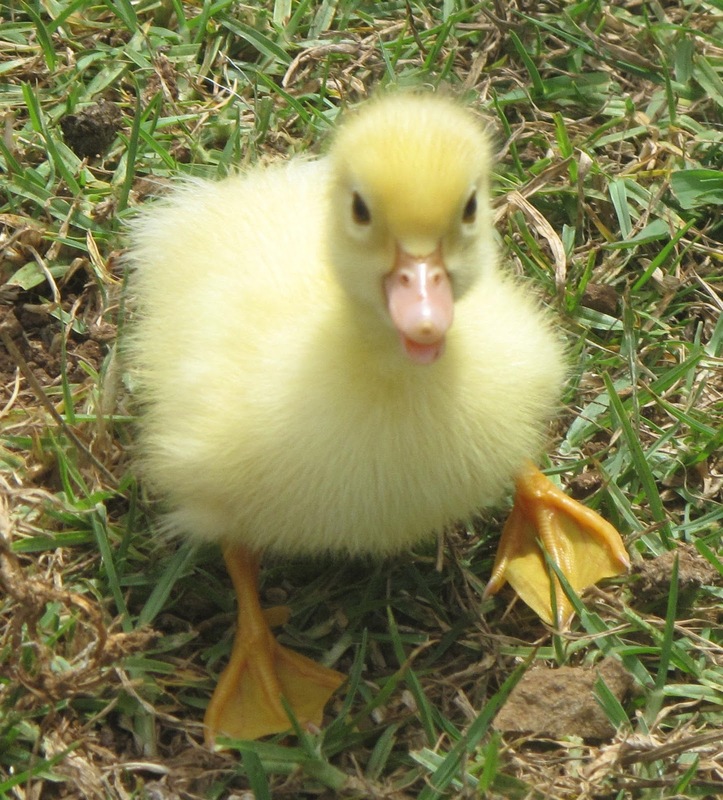 They don't come much cuter than this little fluffy duck. With at least 9 ducklings seen in two clutches this week, we can officially say we are on the first step to these Muscovy ducks being feral on Norfolk Island. 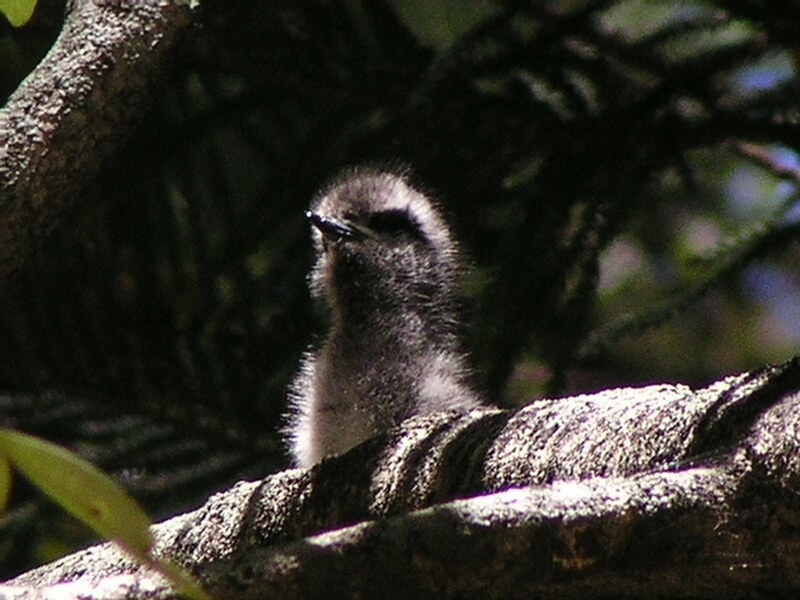 Animals must be recorded as breeding in the wild for a number of years before they are officially feral. 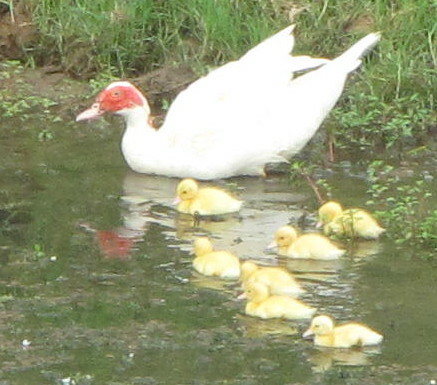 Here is the proof of the first time breeding of the Muscovy ducks at Norfolk. Along with a lot of fowls (chooks as we call them in this part of the world), many other breeds of ducks, and grey and white geese are deposited in the area of the island known as the Kingston and Arthurs Vale Historic Area (KAVHA). It's a bit like a retirement home for elderly or unwanted poultry of various kinds, which the owners have no inclination to kill for their supper.This could be because of squeamishness or because Henny Penny or Daffy could be a bit too much like a family pet. The rather unattractive red wattling all over the face of these ducks will be the look of these little yellow ducklings before we know it, so it's a good idea for locals to take the kids to see them while they are still cute as bathtub ducks. 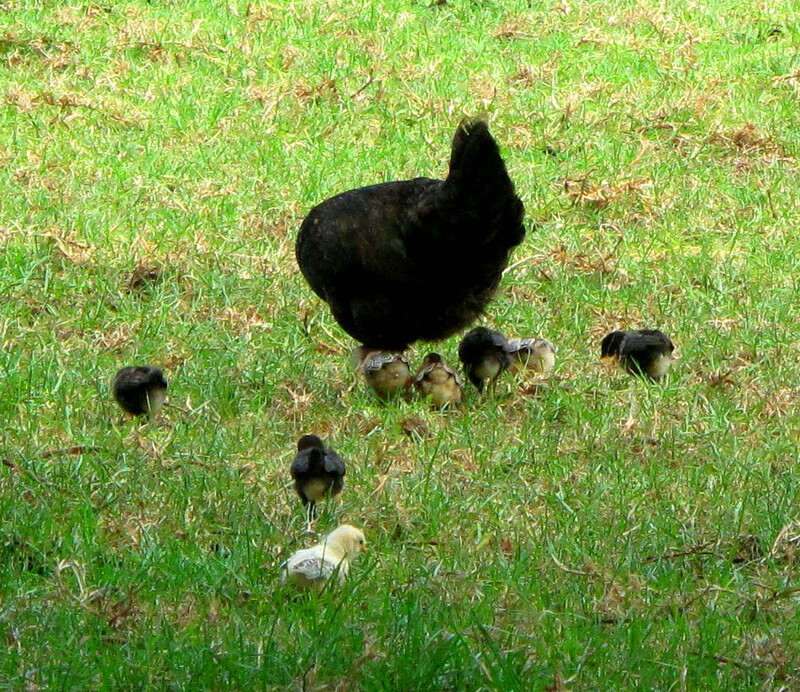 It was an extraordinary day in KAVHA, as I wandered amongst the ruins of the colonial and convict past, as the chooks at every second pace seemed to be cluck-clucking to newly hatched chicks. I frequent this area often and have never seen so many brand new chicks at one time. The Watermill dam was originally built in 1790, only 2 years after the settlement of the island. The dam was constructed of earth, and placed at the confluence of three streams, with the swampy ground below it drained by a man-made channel, rendering the area more suitable for agriculture. The stone mill building was a later addition, coming many years later after the first settlement had been abandoned in 1814 and the infamous convict settlement begun in 1825. The mill was constructed in the 1830s and was used for the grinding of grain for the little colony whose population peaked at around 3000. The remains of the mill building can be seen nestled below the pines to the right of the picture. Later in the 1830s a report reveals that the earth-walled dam was no longer able to hold water, and stone lining was added to make it more secure. In the days after the Pitcairn settlers arrived, (1856) it was obviously no longer watertight, as it was used as a market garden, and the 2nd generation owner of the property from which this photo was taken tells me it was still a vegetable garden in the 1960s. By the 1970s it was once again being used as a reliable water storage facility. As well as providing a place for retired farmyard birds, the dam attracts weary travellers which rest here on their way to and from New Zealand, some coming from across the northern Pacific or heading back to Siberia and Alaska to breed. Blown off course we sometimes see spoonbills, cormorants, egrets and of course ducks. 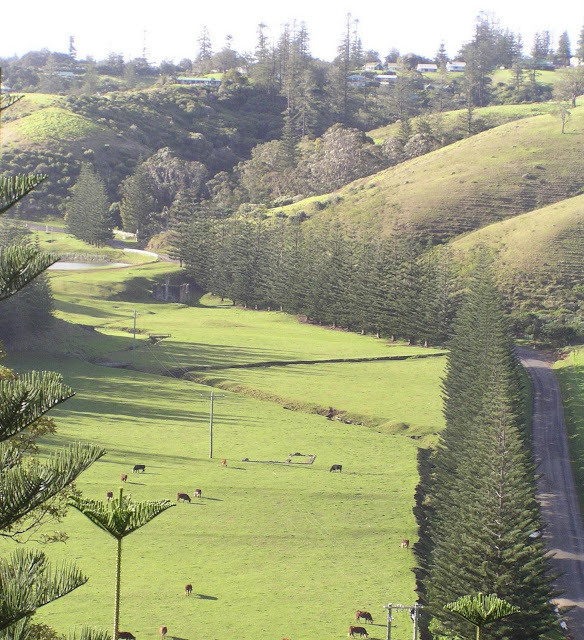 In the image above, the roadside is lined with Norfolk Island pines. The mill is in the shadows cast by the trees at the top end as they march along Aunt Jemima Avenue. It's a lovely custom on the island, that 100 trees are planted to celebrate the 100th birthday of a resident, and Aunt Jemima's avenue was lovingly created by her family and friends in 1971.